From vintage WWII iron to modern touring machines, nothing on the road turns heads like a sidecar. And, like motorcycles, trikes and snowflakes, you won't find two sidecars alike. So, when it comes to sales and service for these one-of-a-kind rides, roll with a one-of-a-kind shop--SO CAL TRIKE CENTER. The heart and soul of any Sidecar is the bike it's bolted to. At SO CAL TRIKE CENTER, we are MMI and Harley-Davidson PHD factory trained and able to service any/all hacks from Motor Trike, Champion, Liberty, to what ever rig you may have. 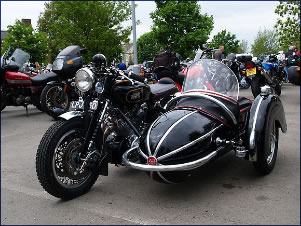 The experts at SO CAL TRIKE CENTER truly understand the unique mechanics and dynamics of your sidecar. SO CAL TRIKE CENTER is also the place to find that sidecar you've been looking for. Whether you want to convert a current bike, go for a ground-up custom, or swing your leg over a road-proven machine that's ready to roll, we are the premier sidecar dealer on the West Coast. SO CAL TRIKE CENTER shares your passion for this unique brand of riding and we are proud to enable your three-wheel addiction. If you already have a rig, cruise by and let us check it out. And if you're looking for one, look no further than SO CAL TRIKE CENTER.